We are situated approximately 3km north of Melbourne Central Business District (CBD). 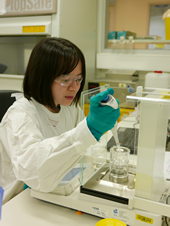 The laboratories are located in the Peter Doherty Institute for Infection and Immunity, on the southeast corner of the intersection of Elizabeth Street/Royal Parade and Grattan Street, near the Royal Melbourne Hospital and The University of Melbourne. If driving, parking may be available in the surrounding streets and in the University Square Car Park which has entrances on Berkeley Street and Bouverie Street. You may enter the Doherty Institute building via doors on corner of Elizabeth Sreet and Grattan Street, on Grattan Street or on Berkeley Street. The WHO Collaborating Centre is located on the 4th floor, accessible via the front lifts. As the Centre is a secure facility, please telephone ahead to arrange to meet your host. From Melbourne CBD: Proceed north along Elizabeth Street past the Queen Victoria market, at the large roundabout (Haymarket Roundabout) at the corner of Elizabeth Street and Flemington Road, stay in the right-most lane and drive around the roundabout to continue straight on Elizabeth Street. The Doherty Institute is on the corner of the next intersection (Elizabeth and Grattan Streets) on the right hand side. From Tullamarine Airport: Proceed along the Tullamarine Freeway and exit onto Flemington Road. Proceed along Flemington Road using the leftmost lane. When you reach Grattan Street (approximately 2km) turn left at the lights. Proceed approximately 200m to the intersection with Elizabeth Street/Royal Parade, the Doherty Institute is on the south-east corner of this intersection. Tram: Several trams run from Melbourne CBD to stops within easy walking distance of VIDRL. Metlink’s tram network information page.